In the suit, Manhattan Borough President Gale Brewer and the City Council claim a deed restriction prohibits luxury apartments on the site. And they are comparing the case to the Rivington House scandal which saw one buyer flip the former Lower East Side nursing home for a nearly $1 million profit after paying to have a deed restriction lifted. “I thought the city had learned its lesson from Rivington, but it appears that would be too much to ask for since it is making the same mistake again with Two Bridges,” said City Council Speaker Corey Johnson. 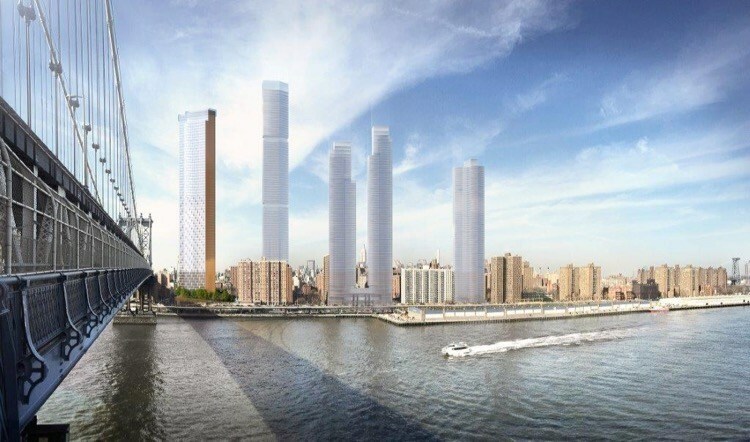 Two Bridges is set to see three new projects come online, not counting One Manhattan Square to be completed this year. JDS Development Group is working on the more than 1,000 ft. tall 247 Cherry Street, L+M Development Partners and CIM Group are working on a two-tower building for nearly 1,400 units at 260 South Street, and Starrett Development is building 259 Clinton Street that offers 765 units throughout 62 stories. In an attempt to stop the projects from moving forward, the City Council and Borough President filed a lawsuit last December after the City Planning Commission approved the projects without the use of ULURP, the city’s process for public review. The lawsuit was updated on January 24 to include a deed restriction that was put into place in 1986 and recently discovered by the plaintiffs. The city’s Law Department said the new lawsuit update is under review. L+M and CIM Group declined to comment while JDS and Starrett could not be reached.